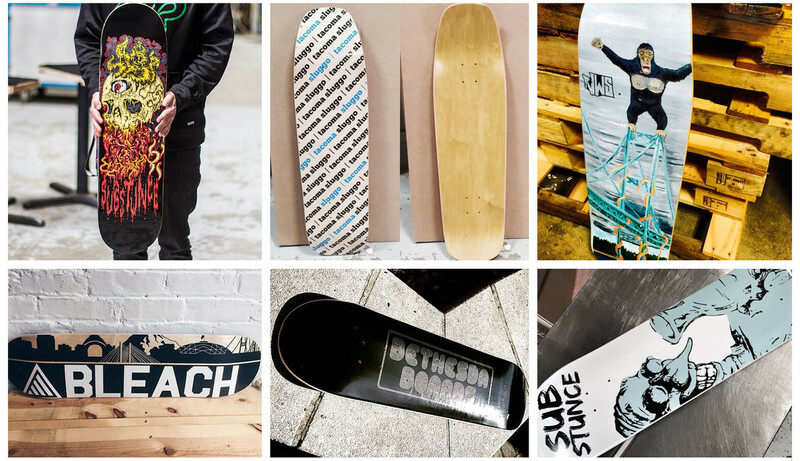 Want to set your skate shop and/or business apart from the rest? We manufacture the highest quality skateboards and longboards for our private label customers. We offer multiple sizes of standard skateboards and longboard decks ranging from 36 to 42 inches. Take a look at some of the information below and contact us for a quote. $50 Setup Fee - Just getting started with your custom deck project? We keep the process easy and affordable, offering a flat rate $50 setup charge for new customers. Low Minimums - Our minimum order size starts at only 50 boards. Don't need that many right away? As long as you meet the minimum with your graphic transfer order we will warehouse them for you, giving us the ability to transfer decks whenever you need! Quick Turnaround - We will always do our best to ensure we meet the timeline for your project. Turnarounds are three weeks for new art - and five days for art on file. Graphic Design Services - Origin has in-house design capabilities and we are happy to help you with art direction for your custom decks. Let us know what your vision is and we'll assist you in getting there! Volume Discounts - The more you order the less you pay! We offer a tiered pricing structure to ensure you receive the best possible picing, no matter the size of your project. 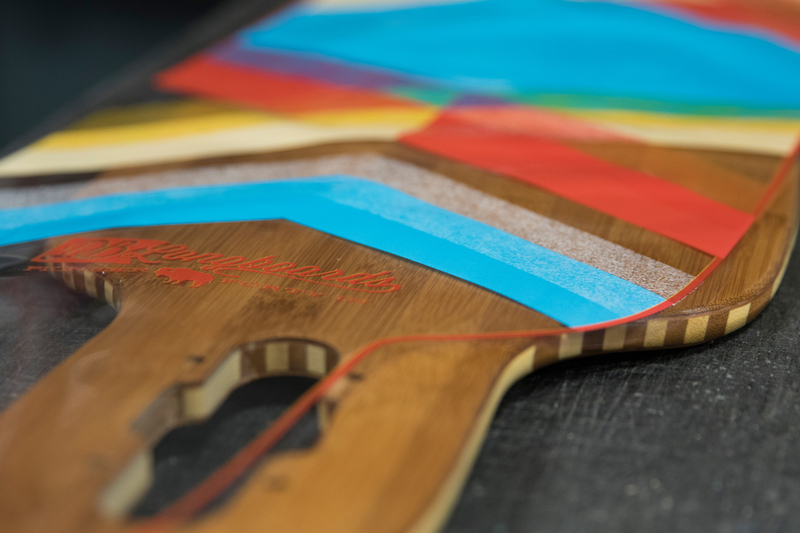 All skate decks come with dyed top ply and single dyed core ply. We offer two shapes of popsicle decks in several different sizes that you can see below. All of our skateboards are made with 100% Hard Rock Maple. A bit different than the traditional popsicle skateboard deck, but just as much fun. These shapes are great for skating pools, streets and parks. 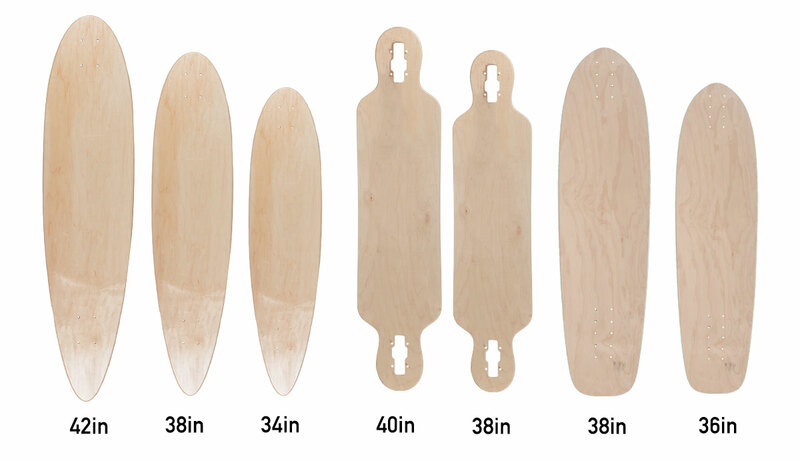 We offer a wide variety of longboard shapes and sizes. All of our longboard decks are made with 100% Hard Rock Maple, CNC cut and are made in the USA at our shop. Graphic Process - Contact us and we'll supply our standard art template to get you started. Submit your art and we'll take it from there, handling everything from graphic and screen setup to application of the heat transfers on your decks. Need help with creating art? We offer in-house design services and can lend you a hand! Custom Grip Tape - We also offer custom grip tape! Using a steel rule die we stamp out your design in the surface of the griptape. Custom die cut grip is an inexpensive way to bring unique product to your store or shop deck program.